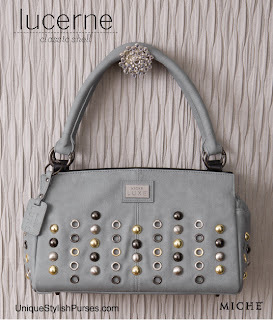 The Lucerne Shell for Classic Bags features a cool shade of chromium grey soft faux leather accented by oversized stud and grommet detailing in various metallic colors. End-pocket storage is the ideal finishing touch. Lucerne is playful and flirtatious and is as at home at a bistro lunch in Paris as she is on a stroll down the sultry streets of New Orleans at midnight. Where will you let this stylish mademoiselle take you?